The Miele Tactical H1 is the perfect vaccum for a small spaces such as an apartmentroom, or as a vacuum for a quick clean up. It is a slim vacuum that comes fully loaded for all of your cleaning needs. 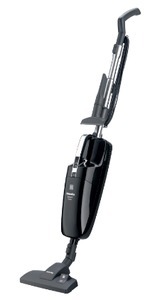 This vacuum comes standard with a SBD 285-3 combination rug and floor tool. The SBD 385-3 is perfect for flat, looped carpet, area rugs and hard surfaces. For high pile carpet there is a built-in socket for a powerbrush. The Tactical's stainless steel telescopic wand adjusts to the length that is the most comfortable for you. A sturdy VarioClip caddy is attached to the wand and holds the included crevice nozzle and upholstery tool for your other cleaning needs.